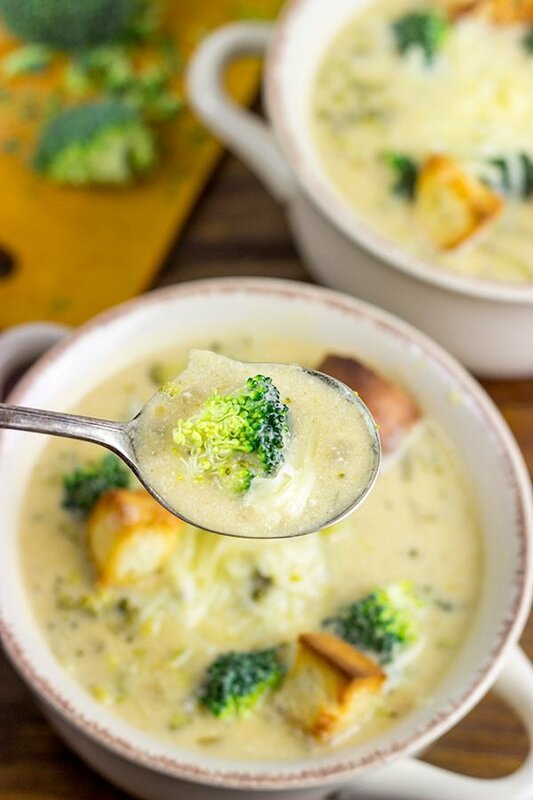 This Broccoli Cheddar Soup is creamy and delicious…and it’s a favorite for these cold winter days! Or there is the whole ‘cover broccoli with melted cheese’ thing. I mean if you ever need to make something more delicious, just cover it with melted cheese. Success! Who doesn’t like melted cheese? Unless we’re talking about chocolate cake. But, then again, why would you need melted cheese for chocolate cake…the cake is already delicious enough as it is. I’m one of those weird kids who liked broccoli. My Mom didn’t have to cover it with cheese or tell me it’s like a dinosaur eating a tree. I just liked it. And get this…I liked it raw the most! And now that I’m older, one of my favorite snacks is a classic veggie dip with a whole plate of raw broccoli. Man, I can tear that one up! Followed by a piece of chocolate cake, of course. Because it’s chocolate cake. Today’s recipe is along the lines of broccoli covered in melted cheese…but it’s reversed. 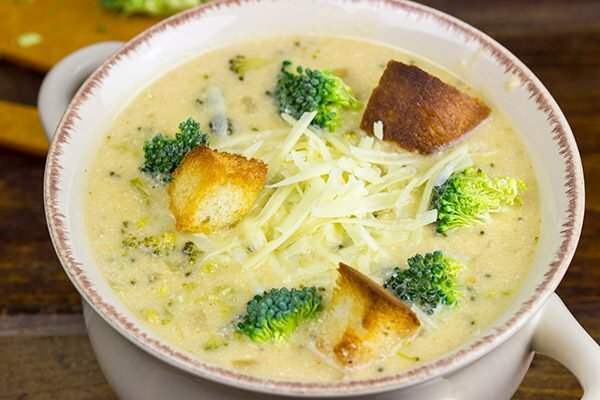 It’s melted cheese (in soup form) with a bunch of broccoli in it. And this Broccoli Cheddar Soup is amazing! It’s packed with flavor, and I could hardly wait for dinner last week when I knew we had leftovers of this one sitting in the fridge. 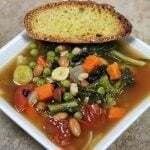 We served up small bowls of this soup alongside some toasted garlic bread and a side salad. Epic winter comfort food right there! I recall ordering broccoli cheddar soup at a restaurant once, and I recall not liking it very much. It was this strange combination of cheese and broth…and the two didn’t quite mix together very well. But this at home version is legit, y’all! And, honestly, it doesn’t take that long to make a pot of this Broccoli Cheddar Soup. You could even make this for a weeknight dinner. However, like all soups, this one tastes better the next day after all of the flavors have had a chance to meld overnight. I’ve even been known to make soup the day before and put it straight into the fridge…just to eat it in leftover form! If you’re anything like us, then you’re hunkered down by the fireplace trying to stay warm this winter. 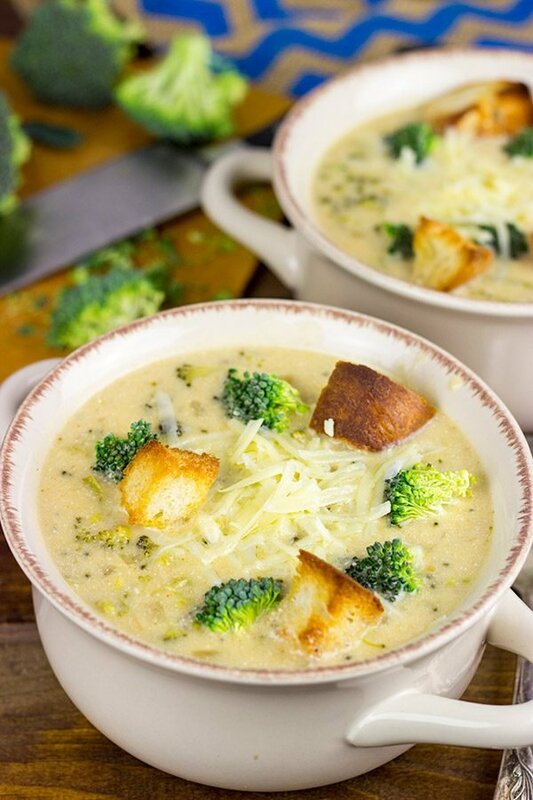 Well take that fireplace day to a whole new level with a bowl of this Broccoli Cheddar Soup! Stay warm, my friends! Using a stock pot or Dutch oven, add 1 Tbsp of butter; melt over medium heat. Add onion and cook until soft (~4-5 minutes). Add garlic, stir and cook for 1-2 more minutes. Add remaining butter and flour; stir until butter has melted and mixture is well combined. Add ½ cup of chicken stock, stirring constantly as you pour to ensure that flour does not clump. Add remaining chicken stock, heavy cream, salt, pepper, cumin, paprika and mustard powder. Stir until well combined. Reduce heat to a simmer and add broccoli florets; simmer until tender (~15-20 minutes). To ensure a creamier soup, purchase a block of cheddar cheese and shred it yourself. Disclosure: I am a member of Cabot’s Cheese Board, and Cabot occasionally sends me cheese. However, this post is not sponsored. I just love their sharp cheddar cheese! A lot. I was one of those kids who loved broccoli too! I’m not a fan of eating it raw, though. This soup looks like just what I’ve been craving, and it just so happens that I’ve got some extra cream and sour cream to use up. Can’t wait to try it! Yes….any veggie covered in cheese is not a bad thing. I’ve always liked broccoli too. You know who also likes broccoli? My fur baby. Funny, isn’t it? I love sharp cheddar cheese too and I bet this taste amazing in the soup. 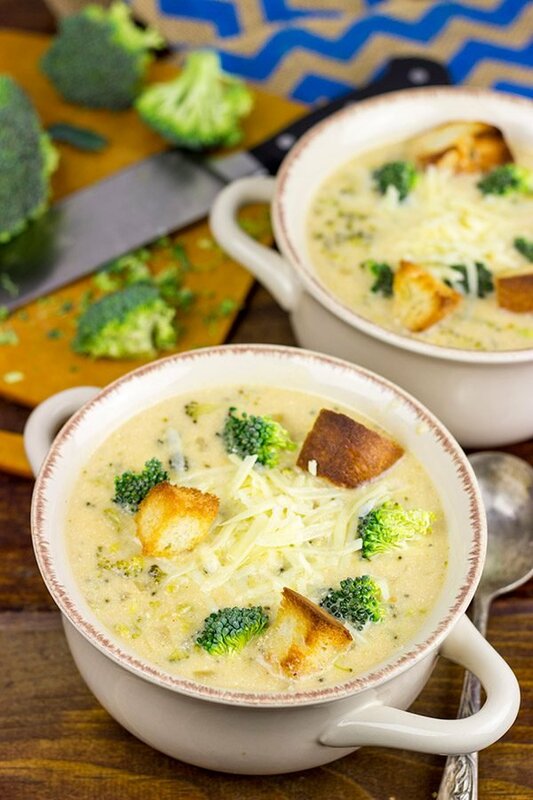 I love how you said that this soup is like melted cheese with broccoli in it 😀 I know you said that it tastes even better the next day, but I wouldn’t be able to wait that long, lol. Considering that we had over two feet of snow this week, I think this soup is in order. Have an awesome weekend, David! Cheese makes everything better, right? 🙂 Especially a good sharp cheddar cheese! I seriously could eat my weight in sharp cheddar cheese! But I’ve actually always liked broccoli, too…so the cheese is just an added bonus there. This soup is definitely a keeper for these cold winter days, Dawn! Enjoy, my friend…and I hope your week is off to a great start! I LOVE broccoli and Cabot cheddar cheese, what could be better than having them together?! To be honest I’m a fan of all of the whole Cabot cheese family. I can’t wait to try this recipe. Thank-you! We’re huge fans of Cabot here, too, Ellen! I always keep an assortment of Cabot cheeses in the fridge in case I get the craving for some delicious cheddar cheese…which happens quite often around here. 🙂 This Broccoli Cheddar Soup is a keeper for these cold winter days. I hope you enjoy it as much as we did! Thanks so much for stopping by and commenting!! Hi David. 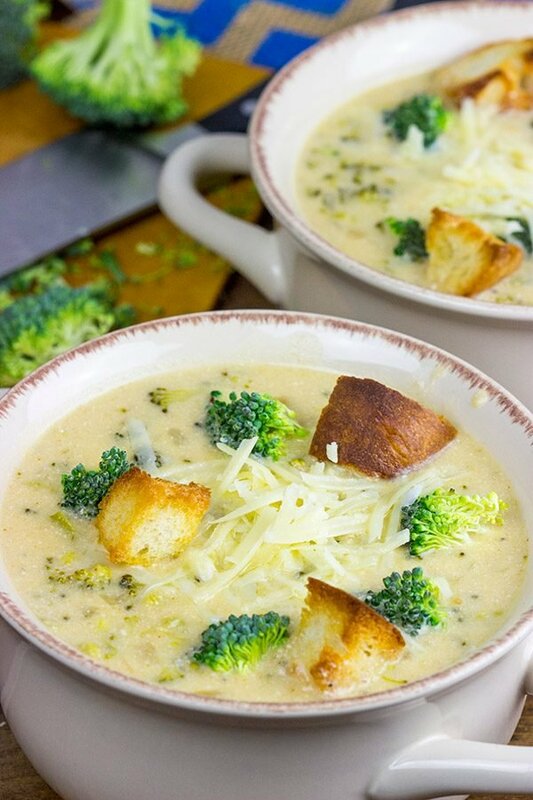 I haven’t made broccoli cheese soup in a long time, but I think I might have to make it soon even though our temps will be 70 this weekend. I love big croutons in soups and salads and Gary hates croutons. And Cabot cheeses are the best. Stay warm and have a great weekend my friend. 70!? 70!?! No way. I refuse to believe that, Dorothy! I mean I hope you guys are heading into spring…but you need at least one more cold weather blast so you can make all of the winter favorites, right? 🙂 This soup definitely deserves a spot in the winter lineup! 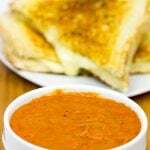 It’s delicious and comforting…perfect winter food. And I hear ya on croutons. We can share a big batch of those…we’ll just steal Gary’s! Haha! Yes! Broccoli friends forever! 🙂 Whenever broccoli goes on sale at the grocery store, I always stock up. Like a little bit too much. But broccoli is just so good! 🙂 Yeah, this soup definitely deserves a spot in your winter comfort food rotation, Manali. It’s delicious! Thanks, my friend! I loved broccoli as a kid too (and spinach!) – still love them both. And there really is something magic when you pair cheddar with broccoli. One of my favorite no-recipe dinners is a baked potato loaded up with broccoli and cheese. And broccoli cheddar soup is one of my favorites, though I’ve never made it at home. But now I must! So I’m the other way around, Kathy. I loved broccoli cooked…but now I’ve come to love broccoli raw, too. (Maybe even more than cooked?) But either way, this soup is delicious! Definitely perfect for these cold winter days. Thanks, my friend! I’m one of those kids that liked broccoli too. I know I’d love your soup and you are right, Cabot is my favorite cheese. It is harder to find here in Florida than it was in New Hampshire but definitely worth searching for. OK, well my mom was defiantly one of those who would try to cover it with a horrible cheese sauce. Worse still, she would steam the life out of the broccoli with carrots and cauliflower. Nearly ruined broccoli for me. That said, these looks like the ideal sit down in-front of the fire with a good beer type of soup. Just my style! Broccoli didn’t involve a bad rep when I was a kid. The answer is simple – we didn’t have most of delicious veggies like cauliflower, asparagus, Brussels sprouts, sweet potatoes, and some others in Russia those days. Maybe that’s the reason I’ve always loved this stuff. Anyways, I do like broccoli, and soup always is a good idea. And I DO like you used smoked paprika and cheddar, David. Man, then you must be making up for lost time now, Ben! Actually, does that explain the lavender thing, too? I’m a huge fan of smoked paprika actually…when used appropriately, it really can add that extra layer of awesomeness to a recipe! This soup is definitely a keeper for these cold winter days. Enjoy, my friend! Haha…perhaps that’s why I liked broccoli as a kid, too, Mary. It’s kind fun to pretend to be a big monster eating whole trees. 🙂 Oh no! I’m so sorry to hear that you’re a bit sick. I’ve been fighting a cold for 2+ weeks now…and I’m SO over it. A good bowl of soup is definitely what the doctor ordered! I hope you feel better soon, my friend! Too funny- You liked broccoli as a kid! Have you ever watched that Rugrats episode where Angelica had a dream that she took her parents to jail for feeding her broccoli? That legit made me dislike it, even though I liked it before!!!! Anyway, cheese can legit make anything perfect. Wait…I thought your Mum invented broccoli? How could you not like it?? 🙂 I was never a huge Rugrats fan, but I think I have still seen the episode you mentioned. Either way, broccoli deserves a 2nd chance…especially if you cover it in a delicious sharp cheddar cheese! THIS is most definitely EPIC winter comfort food! Toddler-you is every parent’s dream! Broccoli wasn’t big in Sri Lanka (so cool how so many veggies are native to their lands – I grew up on greens such a gotu kola, pole beans and okra) but it is one of my favs now! But, even tho Lil Shashi likes broccoli now, she didn’t when she was a toddler. If we had had a dog then, I know it would be one well-broccolied dog! Woah, woah, woah there, Shashi! I’m pretty sure toddler-me was still a big pain in the you-know-what. Haha! I might have eaten broccoli, but I think I got into trouble at about every other turn. Oh, and there was the whole addiction to powdered sugar doughnuts thing, too. 🙂 This Broccoli Cheddar Soup turned out quite well…and it’s definitely in our rotation for cold weather comfort food now! Oh, and yes, I’ve been craving some broccoli + veggie dip ever since I wrote this post. Yum!! 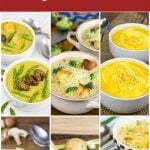 I’m all about soup this winter (and probably every winter for that matter!). So I like broccoli and I like cheese (I’m with you on the sharp cheddar!) but for some reason, I haven’t liked broccoli cheddar soup the few times I’ve tried it. Maybe you’re right though, it’s got to be made with really good, high quality ingredients for me to enjoy it! This looks delicious! Great photo! Will be trying this recipe, thanks for sharing! I always have a problem with a mealy texture look. I’m a very experienced home cook making roux and gumbo A LOT! Something is separating in a not so pleasing way! Sour cream maybe?? It’s driving me insane! This the only cream soup I make and eat. I’m a broth fan. HELP!!! Hey there, Tracee! First of all, congrats on making roux and gumbo. 🙂 As a former resident of Louisiana, you’re talking my kind of language there! So based on your comment, I think it is indeed the sour cream causing the separation/curdling issue. One idea is to stir in the sour cream once the soup has cooled. (I admit this is more difficult if you are trying to eat the soup fresh though!) The quick temperature change of putting cold sour cream into boiling liquid is causing the separation. An idea here would be to take a bit of the hot soup liquid and stir it into the sour cream to temper it (i.e. slowly bring the temperature up so it’s not as cold). I’ve also heard of adding a bit of cornstarch/water mixture into the sour cream…but I’ve never tried that approach myself. Finally, I did a bit more research into this idea, and it looks like soups should never be returned to a boil after adding the sour cream. (Instead, the soup should just be slowly heated until hot…not boiling.) I’ve adjusted my recipe above to reflect that…but I obviously need to try that myself. I do hope you give this soup a shot again! If you do, will you let me know how it turns out? Thanks so much for your comment!